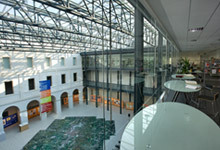 The Cultural Centre of Padua, situated in the heart of the city, organizes and proposes exhibitions, debates, festivals, shows, courses and conferences. It is a five-storeyed structure with a total floor area of 12,000 sqm. The Centre is a place “to exploit”, where one can socialize, study, attend concerts, shows, have lunch or just have a cup of coffee and read a book.